If you don’t have the time for endless convoluted books and websites we’ve simplified it for you ‘less is more’, in effect the ’Shakespeare Authorship Question Solved’ – the next in the ‘For Dummies’ series even. In a fast-paced world of 20 second sound and social media bytes the consumer wants Einsteinian simplicity. The Shakespeare authorship question aside, we will be spotlighting the importance of Theatre in Education (TIE) and setting up its own Foundation and theatreineducation.org.au website and Theatre Channel. 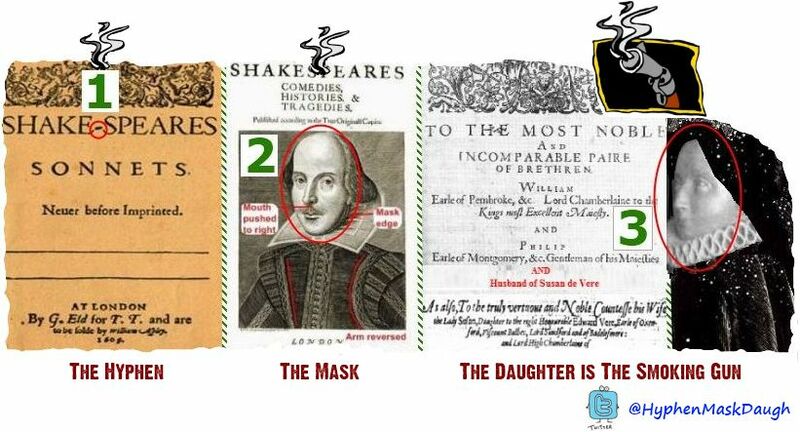 SHAKE-SPEARE = Pallas Athena = “Shake a Spear at Ignorance”. Yes indeed, the spear-shaped ‘pen is mightier than the sword’ or in modern times the pen becomes an iPad keyboard thus now ‘The Internet is mightier than the Establishment’. No longer is it a case of being force-fed by elitist academics with lifetime employment and book contracts with dinosaurs. If your child attends one of their institutions it’s time for action against such snobbery, let them get up in front of parents and declare they really believe the Stratford guy is not a frontman. Then demand the School Board fire them. Time for some new blood. The Sonnets published in 1609 are really the simplest way-in to see that Edward de Vere is William Shakespeare (and conversely a major headache for Stratos). Elizabeth Trentham was obsessed with restoration of the Vere family seat of Castle Hedingham in Essex for their son Henry, now the 18th Earl of Oxford. In 1591, Vere, a la King Lear (note the rhyme), had signed Castle Hedingham over to his (then young) 3 daughters in trust as a result of pressure from William Cecil Lord Burghley (their grandfather). By 1607 this dispossession grates on Elizabeth Trentham, Henry is now 14 and needs to take his rightful place in society. The 3 daughters have married well and don’t need Castle Hedingham. Elizabeth was going to need a lot of money to buy out the daughters (and their husbands) more than the proceeds from the sale of King’s Place (it had been the scene of Henry VIII reconciliation with daughter, Mary; then it has a series of owners, including William Herbert, 1st Earl of Pembroke) in Hackney – where Vere spent the last years of his life writing new works and revising old ones. Elizabeth Trentham was also going to have to sell some of her late husband’s works too. She had access to expert advice on the literary market through Susan de Vere’s mother-in-law, Mary Sidney Herbert (mother of the “Incomparable Paire of Brethren”) and her ‘close’ friend Fulke Greville. Both edited Philip Sidney’s works for publication after his death, including Astrophel and Stella, being an important milestone in the history of the English sonnet. Despite their individual loyalties Fulke Greville and Edward de Vere go way back at least 30 years to the early 1570s. Once when their fireworks antics in Warwick (Fulke’s hometown in Stratford on Avon) got out of hand and they had to teamed up to rescue some villagers from burning houses. 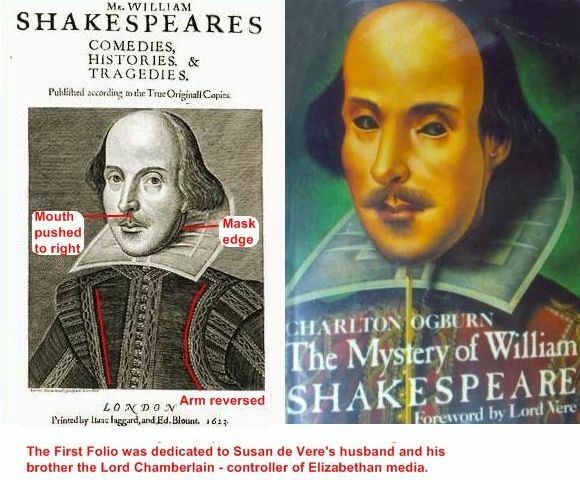 In 1608 they test the market since no Shakespeare work has been published since Vere’s death in 1604 after averaging 2 publications each year since he settled down with Elizabeth in the early 1590s. Indeed Robert Brazil (1955-2010) notes that where before the marketing slogan for the latest Shake-spear publication was often “improved” or “newly augmented“, use of such wording in Prefaces stopped after 1604. These Plays were mainly reworks and included King Lear (1608 – revision of 1594 – the happy ending version). And Troilus and Cressida, 1608 [revision of A History of Agememnon and Ulysses 1584; and 1599 (and almost in 1603). An E. Vere writer to an E. Vere reader. 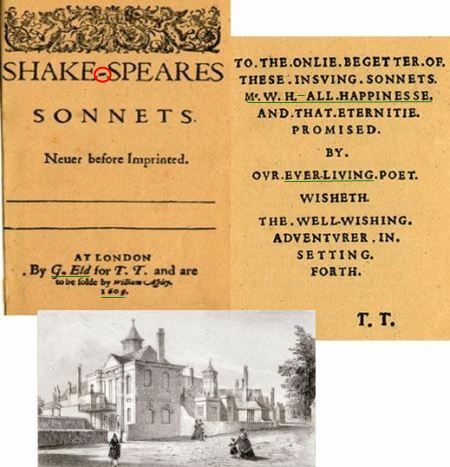 It goes on to mention the ‘grand possessors’ of the Shake-speare works following Vere’s death 5 years earlier (remember Shaksper is still alive). And it’s the same printer as the Sonnets, the one and only, George Eld. Shake-speare Plays would not be enough. They know they are going to need something special to really wow the market. They all know about Vere’s Sonnets that were passed around these literary families for years (just like Philip Sidney’s were). In the meantime, Elizabeth Trentham is having King’s Place cleaned and made ready for sale. On 1 April 1609 Elizabeth Trentham was given royal permission to sell King’s Place. 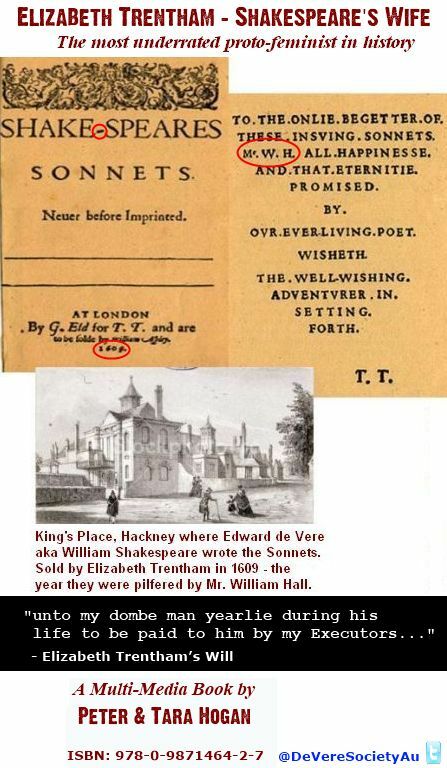 Next they use William Hall as their frontman in getting the Sonnets published – Stationer’s Register 20 May 1609 – Hall also ‘procured’ A Four-Fold Meditation, 1606 – for same printer as Sonnets, viz., George Eld – Hall had with connections to Vere through Anthony Munday, Hall’s cousin; he was mixed up Munday’s/Vere’s The Mirror of Mutability 1579 also dedicated to Vere – back in their Silexedra-Bishopsgate early days – Hall a probable ‘hanger-on’ followed Vere to King’s Place. Fulke Greville was then only too happy to make up the difference – Kings Place is then straight away in June sold by Elizabeth Trentham to him for £4,980. Immediately, after all this on July 8, 1609, Countess Elizabeth Trentham signed papers that brought Castle Hedingham back into the de Vere family. And we have the man that edited Philip Sidney’s work, Fulke Greville (very much connected to the Veres and Sidney-Herberts, but no record connects Greville to any Guillem Shaxper even though they are both from Stratford), in the thick of it. A couple of years ago there was a news report – The Daily Telegraph – “Tomb could end riddle of Shakepseare’s true identity” – about Fulke Greville’s expensive tomb in Warwick where some Stratos thought there might be the only extant Shakespeare manuscripts – mysteriously they called off the high tech underground probe when they found out about the Edward de Vere connection to Hackney (but no similar documentary evidence whatsoever linking Greville to Shaxper). And of course the standard eulogy phrase OUR EVER-LIVING POET clearly tells us the poet was now dead – Edward de Vere having died 5 years earlier (Guillem Shaksper is still living for another 7 years). Even Stratos agree there were no Sonnets written later than 1604, the year de Vere died (cf. Guillem Shaxper d. 1616). A nice and simple place to start is Sonnet 37. It then plugs like a main circuit cable straight into the Plays – King Leir (c. 1594) / and the later King Lear Rework. If you still have trouble with the Shake-speare – Pallas Athena/Minerva link few explain the itty-gritties better than Christopher Paul at a Shakespeare Fellowship Forum. 3. 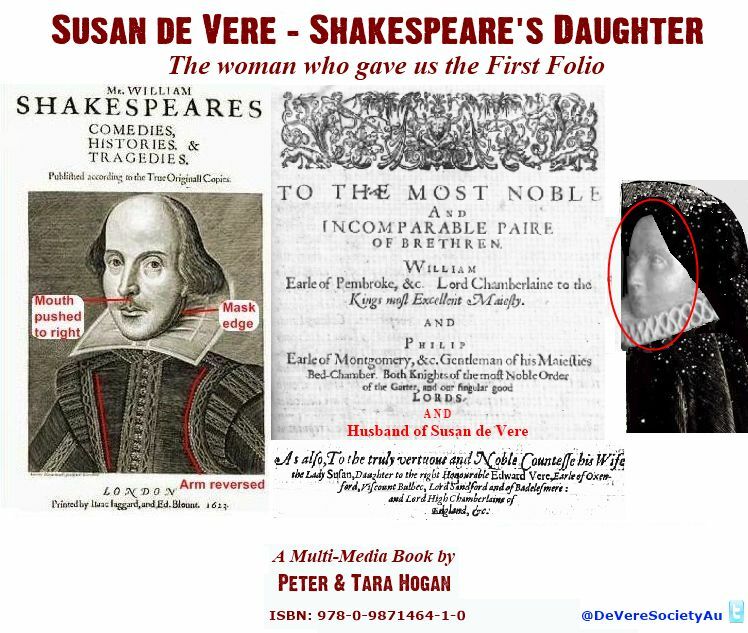 The Daughter – First Folio – Producer/Shaker was Edward de Vere’s daughter, Susan – her hand in safeguarding the manuscripts; editing with her mother-in-law, Mary Sidney Herbert and Fulke Greville; expediting publication, especially to get her brother Henry out of the Tower. 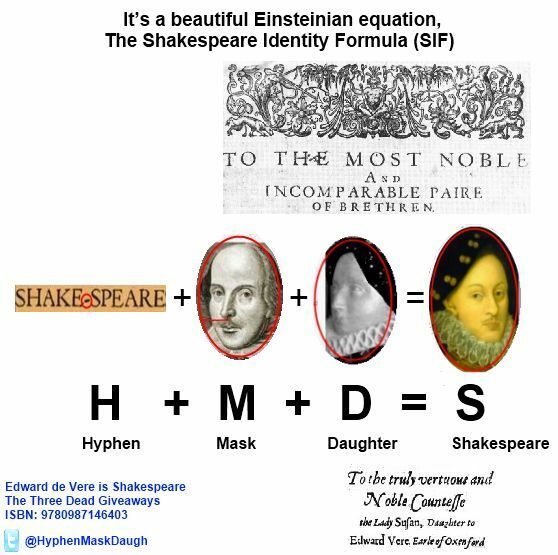 You can see how this beautufil Shakespeare Identity Formula whiffs its way to the ‘smoking gun‘ – first we have the ‘smoke‘ coming from the Hyphen …mmm “didn’t know about any hyphen”, then, more ‘smoke‘ coming from behind the Mask on the front of the First Folio, …“didn’t know about any mask either, someone is trying to tell us something”, and who just happens to be behind the production of the First Folio …The ‘smoking gun‘ is the Daughter. “Well, I certainly didn’t know Edward de Vere’s daughter keeps popping up from the Sonnets to the First Folio”. Our research into Susan de Vere’s ‘collaboration’ with Mary Sidney Wroth on The Countess of Montgomery’s Urania (1621) confirms the use of Edward de Vere’s (and in turn his ‘collaboration’ with Anthony Munday) work on Amadis de Gaule going back to the 1590s until the 1619 publication, also produced by Susan just before work began on printing the First Folio. The Stratfordian Sham Industry has the incumbent advantage of 400 years of muddied waters. It’s been easy for them to deflect scrutiny. 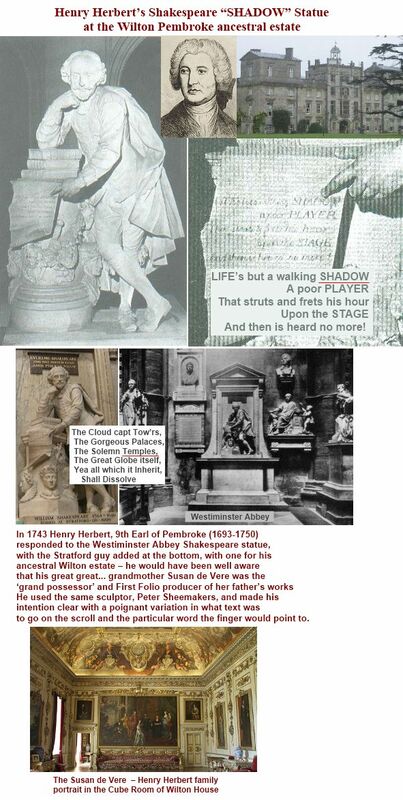 History is largley fabricated by elitist snob white males like Shakespeare BirthPlace Trust chairman, Stanley Wells. You don’t read that the first great civilizations: the Sumerians (Iraq – writing, the wheel, law, oldest extant flood story with arc…), Indus Valley (India – the number system no less…) and Egyptians (the calendar commandeered by you know who, so now we have an international year counter that glorifies a religion…) …that they were all black. The ‘Lawrence of Arabia’ sham based on history only 100 years back was easy to perpetrate right from the get-go with Lowell Thomas’ first shows of 1919. Not even in their own country is anyone interested that it was really the Australian Light Horse that conquered the Ottomans, even the Australian War Memorial promotes the Lawrence myth. David Lean’s movie (about to enjoy it’s 50th anniversary in 2012) leaves them out completely. BBC publications have Lawrence taking Damascus. What chance have you got with 400 years when it’s only 50 years back to when Rosalind Franklin had her work on the DNA Helix plagiarized by Crick and Watson. They went on to fame and fortune, she died of cancer at barely 38. Alone and shafted. The rewriting of history keeps happening. What’s the official history on the reason for George Bush’s invasion of Iraq just a few years ago… does it mention that word with 3 letters. Just what are we teaching our children? In any library or book store there are more books on Shakespeare than any other subject including religion figureheads. That makes it a good place to start slipping in some historical accuracy. What was needed was akin to high tech satellite computer imaging identification. From a distance of 400 years we needed to be able to zoom-in on the right fish in the Elizabethan pond. We needed to simplify things like Einstein’s dumped wife, Mileva Marić, who was a brilliant mathematician, where he wasn’t. The Stratos thought that would be impossible.